The story of a manatee suffering from entanglement had a happy ending when the manatee and her calf were released into the wild at Blue Spring State Park in December. The manatee, named Una, had been ensnared in fishing line for three years. 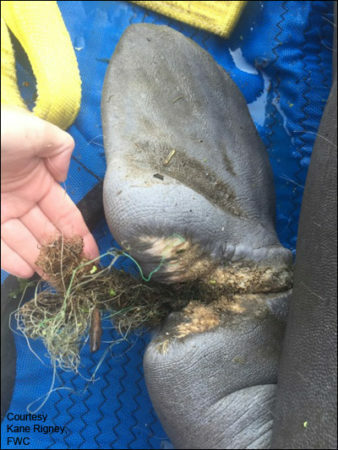 She is a clear example of why discarded fishing line and plastic are dangers to manatees. A photo of Una in 2014 shows the line entanglement on her right flipper. Una was rescued as an orphan from the Ortega River near Jacksonville, Florida, in December 2003. At that time, she weighed 170 pounds and was a little over five feet in length. She was taken to SeaWorld Orlando and released three years later at Blue Spring State Park in February 2006 with several other manatees. By that time, Una had grown to over eight feet in length and was 980 pounds. Una reacclimated well to life in the wild and continued to visit Blue Spring in the winter. Then in November 2013, she came into the park with a fishing line entanglement on her right flipper. By January 2014, the entanglement was much worse, but now Una had a calf and was nursing an additional yearling. A rescue was contemplated, even with the nursing calf, but it never occurred because Una would depart the spring before a capture attempt could get underway. During the 2015 – 2016 manatee season, Una came in to Blue Spring with even more line entanglement that connected both of her flippers — almost like she was handcuffed. Luckily, in January 2016, a researcher from Sea to Shore Alliance, with assistance from Save the Manatee Club staff, was able to cut the line connecting Una’s flippers. However, line on each flipper remained. A rescue was again considered until researchers noticed that Una was pregnant, and the capture was postponed so as not to endanger the calf. The fishing line embedded in Una’s flipper, shown on the day of her rescue in November 2016. Then in November 2016, Una came in with a large calf, and she and the male calf were captured and transported to SeaWorld Orlando to have the embedded line removed. Everyone was hoping Una could be treated and released quickly, but unfortunately, she developed internal issues and had to be temporarily tube-fed as she had stopped eating. Finally, in the fall of 2017, Una and the calf, named “Misterbaby,” were cleared for release. However, the release of Misterbaby became a concern as he was larger than expected for an 8-month-old calf at the time he was rescued. Was he actually Una’s biological calf, and would he have enough winter experience to survive if he didn’t stay with her? Save the Manatee Club committed to providing tracking equipment so that Misterbaby could be monitored upon his release by the Manatee Rehabilitation Partnership (MRP), a cooperative of agencies, organizations, and oceanaria with a mission to rescue, rehabilitate, and release manatees (Save the Manatee Club is a charter member and MRP partner). On December 12, 2017, Una and Misterbaby were released at Blue Spring State Park, and the release went well. “Una behaved as if she hadn’t been away,” said Wayne Hartley, Save the Manatee Club’s Manatee Specialist. But Misterbaby did not leave the Blue Spring run until December 20th. (It’s not unusual they didn’t stay together. Had they remained in the wild, it’s possible Una would have weaned him by this time.) Then on December 21st, Misterbaby was found in a creek north of the spring, feeding and socializing with other manatees. That was good news. Since that time, Misterbaby has traveled to several areas outside of Blue Spring and was even seen near Lake Monroe, which is about 14 miles away. He also made his way back to Blue Spring’s warm water refuge during a cold spell in early January. These are all signs that indicate he is adjusting to life in the wild, and on January 22nd, his tracking gear was removed. We are hopeful that Una and Misterbaby will do well. Many thanks to staff from the Florida Fish and Wildlife Conservation Commission, Sea to Shore Alliance, Blue Spring State Park, Volusia County, Save the Manatee Club, SeaWorld Orlando, and the numerous citizen volunteers who assisted in the rescue, rehabilitation, and release of these two manatees. Watch for mentions of Una and Misterbaby in Wayne Hartley’s updates and see if you can spot them on the webcams at Save the Manatee Club’s ManaTV.org site. Debris in waterways, such as discarded fishing line and hooks, plastic six-pack holders, and plastic bags, is dangerous to manatees and other wildlife. Manatees can become entangled in monofilament fishing line while they feed. They accidentally swallow the line or get it tangled around their flippers. Hooks can become embedded in a manatee’s lips, mouth, throat, stomach, or intestine and can lead to fatal infections. Line entanglements can also lead to infection. 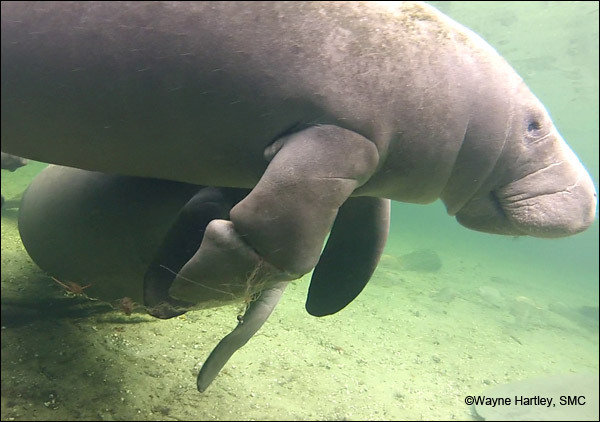 Watch our video: Manatees and Entanglement and find out how you can help.